ORGANIC 520｜ORGANIC COTTON｜IKEUCHI ORGANIC Inc. The quest for ultimate softness has ended. Created with such softness you will let out a sigh of delight when you touch it. The methodically woven pile creates a simple, unpretentious finish that is still soft and cozy. 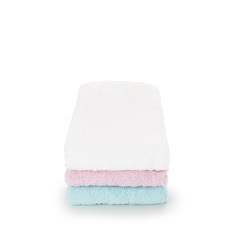 A towel whose pile is soft and springy like a cushion. The pursuit of softness in towel making. When making soft towels, the usual method is to use fluffy unbraided yarn which is suited to a soft finish. This kind of soft towel lines the store shelves in response to customer demand. On the other hand, we have created a supremely soft towel using well plied yarn. 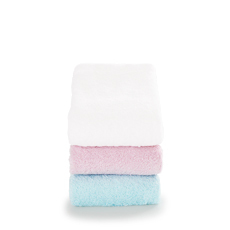 This creates a towel that does not lose its nap or shape, and brings out the best in organic cotton softness. These are all towel, from end to end. Even the pile hem around the edges is made with towel fabric. With a meticulously woven deep pile, we guarantee supreme softness wherever you touch the immaculate surface. 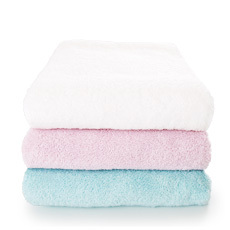 Choose from a range of pastel colors that would make a perfect baby blanket. Our pursuit of ultimate softness will take your breath away with one touch.